The Homeschool Gossip: Homeschoolers Meet the Grizzlies ~ Boone! Homeschoolers Meet the Grizzlies ~ Boone! Bring your Homeschool children for an outstanding night of Grizzlies arena football! The festivities begin on the field at the Holmes Center in Boone, NC with the players. After this watch the High Country Grizzlies take on the Richmond RoughRiders at 7 pm in the team's season opener. Wrap up the night with a meet and greet/autograph session with the players. Ticket options: Special Pricing just for homeschoolers! $5 for single tickets, $11 for ticket/hotdog/chips/drink!! You must email us to get either of these great prices! 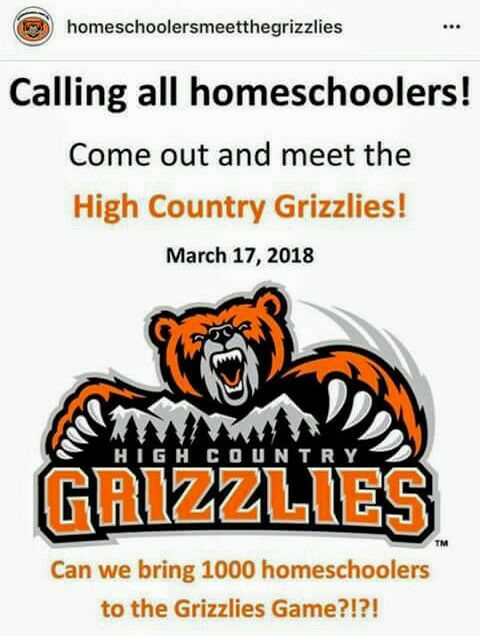 Email homeschoolersmeetthegrizzlies@gmail.com for more info. Let's get 1000++ homeschoolers in Boone!